In early 1963, producer William Dozier, then an executive at Screen Gems (the TV arm of Columbia Pictures), helped initiate the development of a pilot tentatively called The Witch of Westport, recruiting playwright George Axelrod to write a script. Due to a contractual conflict with United Artists, Axelrod soon left the project and Sol Saks stepped in. Dozier sent Saks’ script, now called Bewitched, to New York–based actress Tammy Grimes (star of The Unsinkable Molly Brown on Broadway), who was under contract to both Screen Gems and Columbia. Dozier, who had left Screen Gems before Bewitched reached the air, went on to produce Batman under his Greenway Productions banner in association with 20th Century-Fox Television. Before Batman debuted on ABC to tremendous ratings in January 1966, Dozier was already working on several other projects, including a sitcom showcasing Tammy Grimes — tentatively titled My Twin Sister — with a script by George Axelrod. In July 1965 the Young & Rubicam advertising agency (on behalf of sponsor General Foods) gave Dozier the go-ahead to produce the pilot, for which he signed Don Talyor to direct and Karl Tunberg to produce. After the pilot wrapped in mid-January 1966, General Foods bailed on the show, but Bristol-Meyers stepped in, pressuring ABC to schedule the sitcom at 8:30 p.m. Thursdays between F Troop and Bewitched. Under producers Richard Whorf and Alex Gottlieb, The Tammy Grimes Show commenced production on June 16, initially sharing a crew with The Green Hornet (another Greenway show set to debut on ABC in September). The makers of The Tammy Grimes Show had a million-dollar baby, but they put her in a 10-cent script. In the opener, she got stuck on a Navy cruise while trying to give her brother a present. The whole banal mess was reminiscent of the Smothers brothers in their CBS-TV series last season. Wrong format, wrong everything. What is really sad is that Miss Grimes has enough charm, talent and comedic ability for any dozen performers. It is incredible how so many important people could have mishandled such talent. Just terrible. After ratings declined over the next two weeks, ABC decide to pull the plug on TTGS, airing the fourth and final episode on September 29, then quickly filling the time slot with a nighttime version of The Dating Game — even though six additional TTGS episodes had been filmed, with at least two of them ready for broadcast. Exec producer William Dozier has set Frank DeVol to score pilot of Tammy Grimes Show, a Greenway production in association with 20th-Fox. Williams’ cheerful Tammy Grimes Show theme, featuring a “yeah-yeah” female chorus, resembles the zany comedic music he composed shortly thereafter for the Natalie Wood feature film Penelope. In addition to a 55-second main title and a slightly shorter end title with a more definitive ending, he recorded format music for the show — brief “bumpers” based on the theme for use coming in and out of commercial breaks. ” involves Tamantha being kidnapped by three hoodlums. Uncle Simon, suspecting it to be a ruse devised by Tammy to get $50,000 out of her trust fund for one of her favorite charities, declines to pay the ransom and the crooks finally give up. 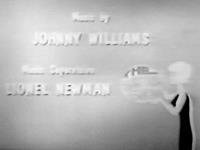 Williams leans on variations of the main theme in the episode underscore, as well as his trademark woodwind runs, demonstrating the sitcom-scoring skills he honed working for a year and a half on Bachelor Father. Most cues are brief, covering scene transitions or quick comic bits. Two of the (slightly) more extensive cues involve lumbering music (voiced on tuba, then bassoon) for the kidnappers, while the longest musical segment underscores a visit by Terence to the Connecticut summer house where Tammy and her captors are hiding. ,” Warren Barker — who scored Bewitched during the bulk of its eight-season run — took over composing duties for the remaining TTGS episodes that made it through post-production. No music from The Tammy Grimes Show has ever been released. 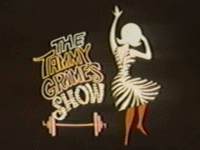 No episodes of The Tammy Grimes Show have been released in any format.